A national nonprofit hosted a series of technology workshops at the University of Montana last weekend, intent on teaching girls from nearby high schools about technology and careers in the industry. The event offered three workshops that taught the basics of programming a smartphone app, designing a webpage, and creating their own soft circuit sewn into fabric. With a ChickTech chapter located in Missoula, teachers can nominate students to participate, making it easier for schools to get involved. “That’s really where the Missoula chapter puts their focus is in that youth programming and really providing opportunities for girls to get exposed to tech and to get exposed to other women who are currently working in tech for mentorship as well,” ChickTech Missoula chapter director Brigitta Lee said. According to a study conducted by the University of Montana Bureau of Business and Economic Research, high-tech companies are a growing slice of Montana’s economy, growing at rates up to nine times faster than the statewide economy. And with more and more careers available in technology, the need for diversity is becoming increasingly important, Lee said. Employees from local tech companies or organizations led the workshops, including Advanced Technology Group, spectrUM Discovery Center and Elevation Web Design. Stephanie Ralls, of ATG, helped lead a app programming workshop. Using the MIT App Inventor 2 platform, girls learned step-by-step how to build software using if statements, loops and others. The software uses colorful blocks that fit together like puzzle pieces, Ralls said, and makes it easier for beginners to learn the basics of programming. “Anything can be complicated and scary, so it’s demystifying this one thing just by doing it,” Ralls said. 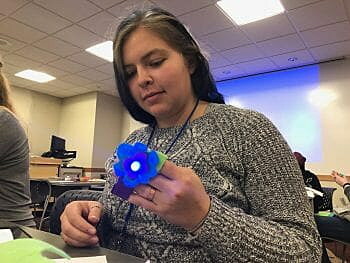 Kate Stocker, with spectrUM Discovery Center, a hands-on family science center in Missoula, hosted a workshop about soft circuits, or electrical circuits made with textiles. Each person made their own light-up bracelet, sewing in circuit thread through a band. Participants also learned how to manipulate the lights to blink and make sounds. Physically making a circuit is equally as important as creating code, she said, and circuits are found in many everyday electronics. The third workshop explored user interface and user experience design, or UX/UI design, a newer profession in the tech industry that focuses on creating a webpage for a client and the user’s experience. Kelsey Iverson, with Elevation Web Design in Victor, demonstrated how to interview a client and think like a website user when designing a webpage. Using a real business that the company works with called Farmer John’s Sustainable Farming, teams designed different layouts based on topics including selling chickens and eggs, goats and wool. Sophia Richter, a student and member of ChickTech Missoula’s leadership team, participated in a competition called the Technovation Challenge a few years ago where she helped create two different apps. Before participating in the challenge, she had no idea she would be interested in programming and never thought she would be a part of ChickTech. She realized that the tech industry needed to provide more opportunities for girls to learn about the various developing careers, especially when it comes to coding and programming. “It’s incredibly important. Number one, technology is almost entirely based on creativity. In order to be able to write code and to problem solve, you have to have multiple ideas and come at it from multiple angles. Having one type of person working on a project in technology, will ultimately fail,” she said. She hopes ChickTech will help girls feel more comfortable with technology and provide them with the tools needed to learn from their mistakes.